One of the greatest aspects of Facebook is the ability for articles and blog posts to go viral very quickly. Just the other day a friend from Chiropractic School posted a link to a blog that discussed common chiropractic myths. It was such a great article I thought I would take a couple of those to share here. The only way to advance a profession that I am extremely passionate about is to increase awareness and education. Stay tuned for a future post on even MORE myth’s debunked! Chiropractic Myth #1: Chiropractors are not REAL doctors. Not only is this myth not true, but it is extremely offensive. Even chiropractic patients are guilty of saying “I need to talk to my real or regular doctor”. A chiropractic college grants a D.C. or Doctorate of Chiropractic degree. Chiropractors are licensed as health care providers in every U.S. state and dozens of countries around the world. The chiropractic and medical school curricula are extremely rigorous and virtually identical. Chiropractors and medical doctors are both subject to testing, boards, continuing education, licensing and monitoring both statewide and nationwide. Chiropractic Myth #2: Once you start going, you have to keep going forever. The best thing about this myth is it’s partially true, but hear me out. No one ever said not to go to the dentist, because once you go you have to go for the rest of your life! We go to the dentist on a regular basis for checkups and cleanings. We want to do our best to prevent future issues. It’s the same with chiropractic care. Your spine experiences normal wear and tear, and it’s important to have it checked. Regular maintenance chiropractic care keeps you feeling great and functioning at 100%. Do I want to see my chiropractor for the rest of my life? You better believe I do! Chiropractic Myth #3: Chiropractors “crack” your bones. What your chiropractor is actually doing is delivering an adjustment, or manipulation of the spine or extremity joints. A chiropractic adjustment is the focused mobilization of a specific joint in the body and acts to affect the joints position and movement. Sometimes, not always do you hear a sound from the adjustment which is called a cavitation. A cavitation is caused by the opening of the joint space and the expansion of gases within that space, NOT an indication that your chiropractor delivered a successful adjustment! So that crack you are hearing is actually just gas! 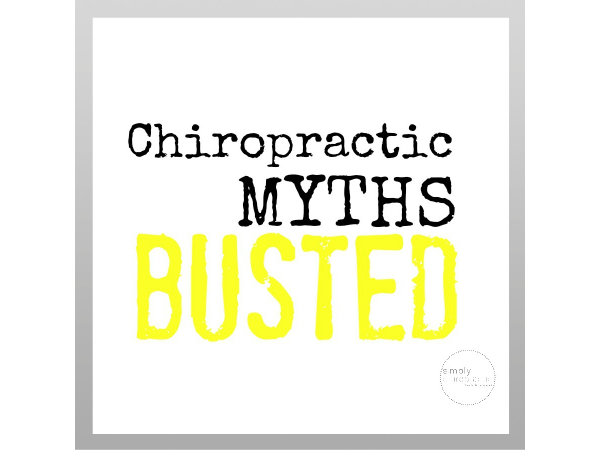 So there you have three of the most common chiropractic myths debunked! If you have a chiropractic myth that you’ve heard, feel free to share it. I’ll put together another post that covers a few more of them next time!